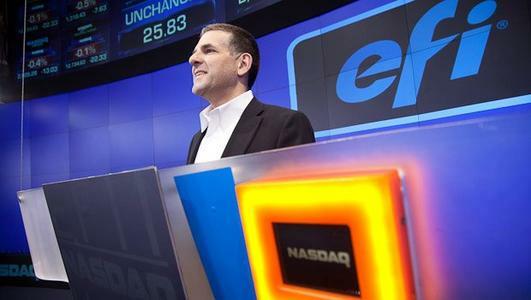 EFI(TM) marked its 20-year anniversary as a NASDAQ-listed company by ringing the opening bell at the NASDAQ MarketSite in Times Square in New York last Friday, 27 January. 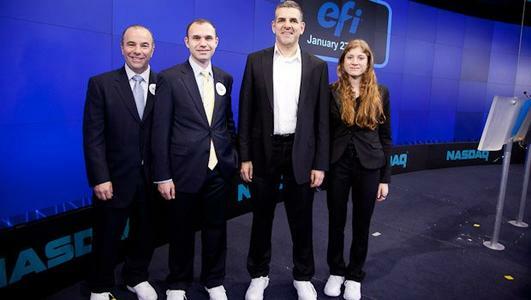 EFI CEO Guy Gecht and the participating EFI executives wore suits with sneakers to bring awareness to Coaches vs. Cancer®, an American Cancer Society® event that took place this past weekend. In his welcoming remarks, executive host David Wicks, vice president of NASDAQ, said: "Congratulations on your twenty-year listing anniversary on NASDAQ. 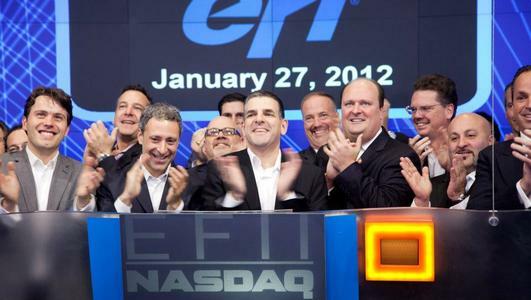 When we look at EFI, we see a company that is driven by the entrepreneurial spirit, as EFI helps drive their customers' business success with a scalable digital product and service portfolio that increases their profits, cuts costs and improves productivity on every job from creation to print. Just three days ago, EFI announced fourth quarter results. EFI saw record revenue up twelve percent year over year and the eighth consecutive quarter of double-digit growth. The stock is up over 19 percent year to date. 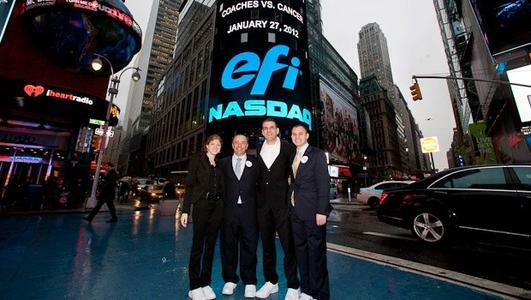 EFI represents a visionary, a game changer, and an innovator." At the event, EFI CEO Guy Gecht said, "In twenty years of being public it has been a great journey with our customers, shareholders and employees as we are revolutionising the industry. Today we remember what it took for us to achieve eight consecutive quarters of double-digit growth - a focus on customer success and helping customers be very competitive with the best technology, as they are fighting on quality and value. We continue to innovate for our many tens of thousands of customers worldwide. We will continue to innovate with Silicon Valley DNA and hard work for our customers. We will not stop except for this one very brief half an hour, ringing the Opening Bell at NASDAQ." He continued, "This might be the first time anyone has opened NASDAQ in sneakers, and we're happy to help drive awareness of the annual Coaches vs. Cancer event." The EFI logo, Fiery, VUTEk and Jetrion are registered trademarks of Electronics for Imaging, Inc. in the U.S. and/or certain other countries. BESTColor is a registered trademark of Electronics for Imaging GmbH in the U.S. EFI and Rastek are trademarks of Electronics for Imaging, Inc. In the U.S. and/or certain other countries. Colorproof is a trademark of Electronics for Imaging GmbH in the U.S. and/or certain other countries. 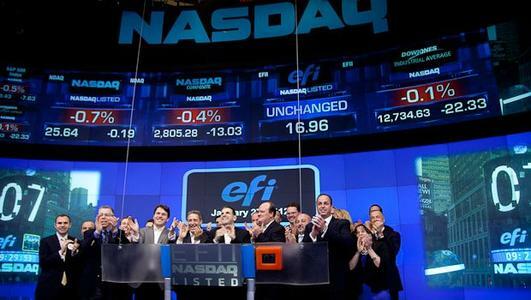 EFI(TM) (Nasdaq: EFII), is a world leader in customer-focused digital printing innovation. EFI's award-winning solutions, integrated from creation to print, deliver increased performance, cost savings and productivity. The company's robust product portfolio includes Fiery® digital print controllers and solutions; VUTEk® superwide digital inkjet printers, UV and solvent inks; Rastek(TM) UV wide-format inkjet printers; Jetrion® industrial inkjet printing systems; print production workflow and management information software; and corporate printing solutions.